Me and my boyfriend have recently visited Slovenia, my home country, and we spent a week in the Gorenjska region in the north, hiking and cycling. I got reminded of the beauty of Slovenia and its mountains, indescribable beauty which I miss dearly when I am in England. Luckily I managed to capture the highlights of our adventures on the video and photographs. You can see the summary of everything we did in the video below, but to learn more about our adventures read the rest of this post. Our adventure begins at the train station in Nova Gorica where we take a train to Bled. Our bikes go on the train of course! The train journey itself is worth experiencing as you will be presented with some amazing views and scenery whilst travelling. The landscape is really green – expect lots of trees, forest, hills, mountains and rivers. Once we arrive in Bled we find our way to our apartment (‘apartma’) which is located a couple of kilometres from Bled, in a small village called Spodnje Gorje. To reach it we have to cycle uphill for a while which is well worth it as the apartment is lovely with magnificent views. Everything we need is provided apart from the food which we later buy. It’s part of a tourist farm Tavcar and I would happily go back there in the future. Our first day in the Bled region is pretty relaxing – we check out the Bled town, buy some food and plan for the following day. On day 2 we wake up quite early considering the fact we are on holidays and leave the ‘apartma’ around 10am. 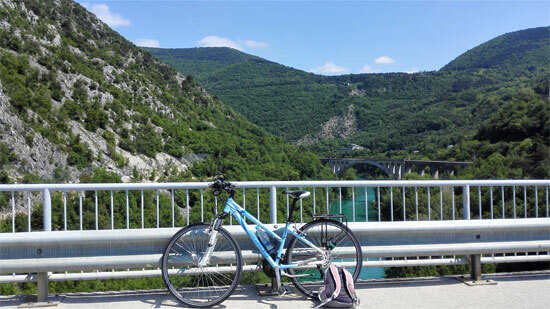 We cycle to Vintgar Gorge, which is not far from the apartment. It’s beautiful there and pictures can better describe it than words (just to mention there is an entrance fee of 4 eur!). We walk through the gorge but we decide to go back another way and walk above the gorge, interesting experience as we encounter lots of fallen trees on the path, many of them are huge and to pass them we have to go underneath them, hoping for the best. We make it back to our bikes safely and go for a lunch to a nearby ‘gostilna’ (type of a pub, but not a pub exactly, here we eat freshly cooked home-made food). The rest of the day is spent exploring villages and towns around Bled. We visit Radovljica, then Lancovo and after that we decide to follow a cycling route by the river Sava Bohinjka which is taking us to Bled again. It’s at some point on this route when the weather starts to turn funny. It’s still sunny but I can see the rain clouds on my right, and I know they are coming towards us. As we continue to cycle, the clouds are getting closer and closer, making me slightly nervous as I know how summer thunderstorms in Slovenia are like. I don’t have a rain jacket with me as I didn’t want to carry with me on a sunny day, but getting wet isn’t too much of a concern to me, it’s the lightning that worries me! It doesn’t help that we miss the turn, end up climbing up the hill and then turn back to follow another route. At the end we still reach the Lake Bled and from there we have around 3km, but quite few hills to climb before we could reach our apartment. At this time the sun is gone and I could hear the thunder in the distance. I am getting more and more anxious, cycling at full speed, doing my 100% but unfortunately my boyfriend is not keeping up with me and I have to wait for him. Really frustrating! The storm is coming and I can feel the drizzle now. After we overcome a few hills we are finally in our apartment, safe. What a relief! We made it without getting soaked and without getting struck by a lightning! I am covered in sweat, looking like a strawberry but very happy we are safe. What a race against the time that was! Nothing can improve my performance better than a race with a storm. Later the rain spreads and reaches us but we are cosily relaxing inside. 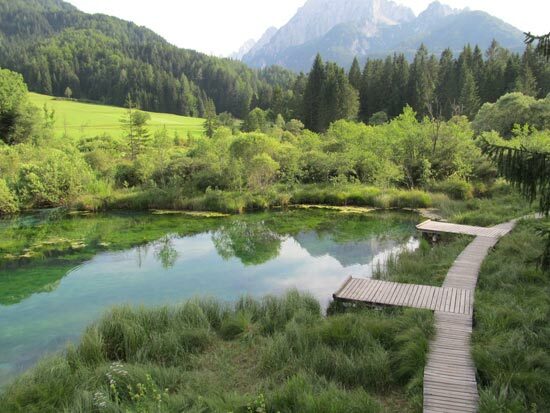 In the morning we pack our stuff, have breakfast and head to Kranjska Gora via beautiful Radovna Valley. The Radovna Valley is a picturesque valley with the river Radovna running through it, it’s mostly flat and it takes us through some forests, helping us to cool down from all the heat. At some point we leave the valley and turn towards Mojstrana. We first have to overhome a steep hill before enjoying the downhill ride to Mojstrana. 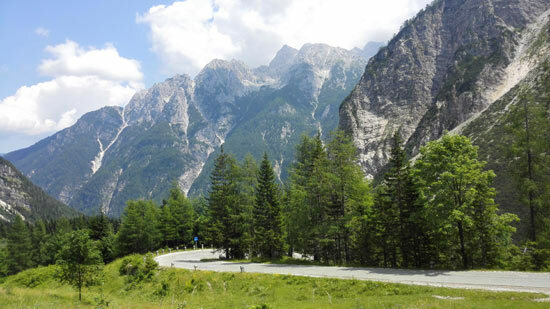 In Mojstrana we find a proper cycle path which takes us all the way to Kranjska Gora. My boyfriend is out of luck, experiencing a flat tyre just before Kranjska Gora but once we check in to our accommodation he fixes it. First day in Kranjska Gora is pretty relaxing – we visit Zelenci, a source of Sava Bohinjka, really pretty place to admire and relax in. After the dinner we relax in the apartment and my sister joins us, coming from Primorska by car. A cloudy day in Kranjska Gora which I didn’t mind. I wanted to have a break from cycling in preparation for Vrsic Pass so not a big deal. We still go for a nice walk and stroll the village though. 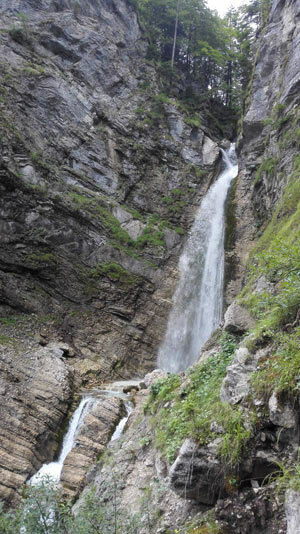 Great weather so we decide to go hiking and visit Martuljek waterfalls. It’s pretty demanding hike with steep inclines but we stop in a lovely mountain hut, taking a rest and enjoying a light lunch. There are two waterfalls to see and they are around 30-45 minutes walk apart. Getting to waterfall 1 is easy but getting to the second waterfall is a bit of a challenge. If you want to get really close you have to climb the steep, almost vertical rocks, luckily there is a metal wire provided so you can hold on to it whilst climbing. It looks scary but after seeing my sister and my boyfriend bravely tackling the challenging climb I decide to give it a go. I am not an adrenaline type so I feel really proud when I reach the top. We decide not to continue over some slippery rocks to reach the waterfall though and just climb back down which turns out to be much more difficult than going up. Luckily, I remember all the steps and ledges so I don’t find it that much of an issue. If you are planning to attempt the same trail I highly recommend you get yourself some hiking poles. They will definitely come handy! I wake up in the morning, legs feeling slightly tired from the previous day. My knees also don’t feel rested and I am experiencing some discomfort. 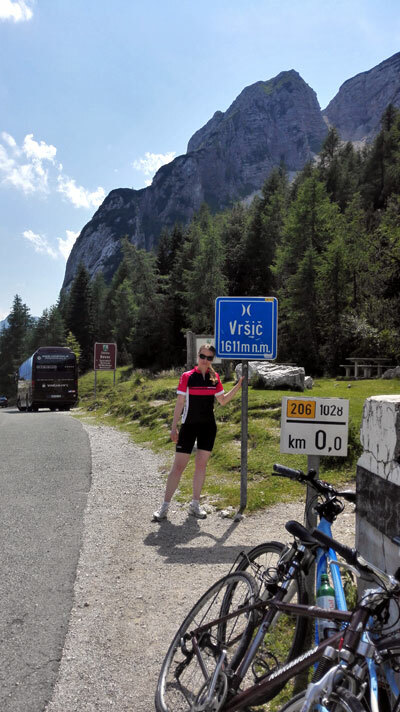 Not an ideal situation on a big day, the day I attempt to conquer the highest mountain pass in Slovenia, Vrsic Pass! No matter what, I still want to do it. I am going to write more about this experience in a separate post but at the end I managed to do it! A demanding ascent and enjoyable ride downhill. 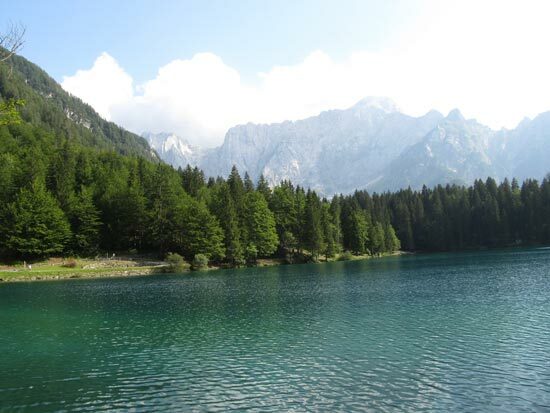 After this achievement we continue cycling – from Kranjska Gora we go to Italy to see beautiful lakes – Laghi di Fusine. Just to mention that Italy is not far and it’s probably 30-40 minutes of cycling to get to lakes but to get there we have to cycle uphill AGAIN. It’s worth it though and we forget all about it once we stop at the lakes and admire the views. After checking out of our accommodation we cycle to Planica, a place where all the ski jumping happens and where Slovenian champions in ski jumping are born. There is a world cup in ski jumping in Planica every year so it’s definitely worth having a look. I’ve been here before but it’s first time for my boyfriend. After Planica we have a light lunch in Kranjska Gora and then we cycle to Jesenice where we get on a train to Nova Gorica. So this was our week in the Gorenjska region in Slovenia! I really enjoyed it, as always. If you ever go to Slovenia these are the places you should definitely visit and if you don’t, you will be missing out. Have you ever been to Slovenia and what was your experience? That looks sooo lovely! I think I have to seriously rethink my vacation planning. Some of the pictures can compete with New Zealand views – just without the horrible jet lag. I am glad you like the pictures Karin! Slovenia is a little paradise in the middle of Europe which people don’t know about and everyone should visit it at least once in their lifetime. Mentioning New Zealand, this is one country I really want to visit one day! Yes, you should definitely go back in summer when it’s really warm and extra pretty. I go every summer and I always wish I could stay longer.. WoW!!! really admirable. Sounds like something freaky cool. I would love eastern Europe and Slovenia added right up there on my list. Thanks a lot for sharing your great thoughts through your amazing post. Looking forward for more from you.